Coex is adding a third show to its collection of international exhibitions in Vietnam with the opening of the VIET Coffee Fair on June 7th -9th 2017. Set to be held at the Saigon Exhibition and Convention Centre (SECC) in Ho Chi Minh, the show will be co-organized with the Vietnam Coffee – Cocoa Association (VICOFA). The new show represents an amalgamation of Coex’s experience as Korea’s largest exhibition organizer, bringing together the knowledge of the Vietnamese market with the expertise from organizing its home-grown Coffee Expo Seoul. 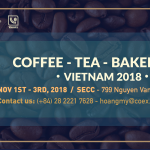 Co-located with the Vietnam International Retail and Franchise show, the coffee fair will host multiple events to please both business and consumer audiences. The Gold Label Showcase will showcase a range of brand new products and allow participants to gauge the market’s reaction and get valuable customer feedback. There will also be a one day class for attendees to participate in professional lectures and provide brand exposure for exhibitors. Coex will also use the VIET Coffee Fair to host the Vietnam Super Barista Championship, an extension of the barista competition it holds at Coffee Expo Seoul. Winners will receive a $2,000 USD prize and an all-expenses-paid trip to Korea to participate in the World Super Barista Championship taking place at the 2018 Coffee Expo Seoul. Vietnam represents a prime market for Coex to launch the VIET Coffee Fair. The cafe market in Vietnam has seen a growth rate of 12% year on year, with the number of coffee shops expected to increase by 15% over the next five years. “We believe that the potential of the Vietnamese coffee market, combined with our experience operating successful coffee exhibitions, will create a powerful platform for coffee industry business owners,”said Bo Kyung Byun, CEO & President of Coex. As the economic centre of Vietnam, Ho Chi Minh has more affluence and purchasing power than almost any other city in the country. With the 80% of Vietnam’s franchise industry belonging to global franchise brands, the city makes for a prime location for the VIET Coffee Fair.